Often the business of day-to-day life prevents us from considering the big picture. In her recent book Resting Place, author Jane Rubietta reminds us how important it is to take time for spiritual reflection. Vacations and church retreats are important, but personal spiritual retreats can help you recover from your frantic life and reflect on God’s gracious will. Crosswalk.com: Why do you think it is so important for believers to consider personal spiritual retreats? Jane Rubietta: All of my writing comes from what I am trying to do in my own life. When I first started, I was a young pastor’s wife and I really hit the bottom, I wiped out, I realized I was so messed up and I realized I needed to get help. I ended up in a 12-step group, just trying to get some healing, but I had to go outside the church to do that. It’s not like I left the church, but as a pastor’s wife, I’m not standing there with a badge on saying, “Look at me, I’m really messed up.” I began hearing other women saying things like, “I’ve got a problem with anger.” “Wow, so do I!” “Why is no one talking about this stuff?” I realized, all those issues were separating us from God rather than becoming tools that would take us to God. One of the things that really saved me when I had personal struggles was when I really started giving myself permission to take care of myself. CW: How did you apply this revelation to your own life specifically? Usually, that includes getting away every month for an entire or a day and a night just to be with the Lord. I wasn’t bringing leftover to-do lists. I wasn’t doing errands on the way. My whole point was just go and be with God. It was just salvation for me, and I ended up moving into a deeper place spiritually. That’s when I started writing, when I realized that God was converting my problems into ways to meet with Him. So I started telling women (that time I wrote I was only speaking to women’s groups) here’s one of those things you can do, here are some ways you can take care of yourself as well. My first book was called Quiet Places: A Woman’s Guide to Personal Retreat, and then I wrote Resting Place: A Personal Guide to Spiritual Retreats for women. It’s not an exegesis of Psalm 23, it’s sort of the framework; the Lord is my shepherd, He wants to restore my soul, He wants to lead me beside still waters, why don’t I do that? Do I really believe this, and what’s keeping me from it? I look at the issues that sort of stop us from getting closer to God. I look at our anger, our pressures… but I also examine the things that come out of that: a renewed sense of creativity, a deeper awareness that He’s really the love of my life… this is something that will move me out of my addictions, this is the love that will move me, this is the love I’ve been looking for all along. CW: When you talk about personal retreats, you mean something very different from what a Christian would think of as a typical retreat? Rubietta: Yeah, those are the typical “let’s-plan-the-life-out-of-the-people-who-go” gatherings. Let’s give them all the activities and all the workshops and all the electives and all the breakout sessions, and all the keynotes and then they’re talking to their roommates and eating and playing games in the lobby. Then you go home and you have a sheaf of notes that you don’t know what to do with. So eventually you throw them away, and that’s the end of that. I’m not sure how transformational those retreats are. I think they are important for community, and I speak at a lot of retreats. But I really try to get the leaders to scale down and not over-program the people so that they really are having a place to process what God wants to do in their hearts. So yes, it is a different thing. I am talking about a retreat where you set aside time for reflection on the deep questions of life: it’s just you and God. What does God want to do with my life? What does my soul need right now? [Christians are] not good at listening for that. CW: What sort of setting do you think people should seek out for a personal retreat? Rubietta: It’s certainly a personal decision. There are monasteries and retreat houses all over North America. A journalist from Germany told me “we have monasteries all over [Europe] and there’s a new movement among Protestants to go to monasteries for personal retreat.” You can go online and find them. Retreats International has a lot of interesting personal retreats. They’re very affordable. One of the things I like about going into a place that is set aside for personal retreat is that there are often people who are living there committed to pray for you while you’re there and it’s just really a wonderful thing. One of my favorite things is to find a state park that has an inn, and even if you don’t spend the night, if they have an inn, there’s a place where you can sit down and relax, sit on the porch or hike; a state park is good. You can go to a library as long as nobody knows you’re there and you’re not going to end up in a big conversation. I like a place where you can actually rest, so it’s nice to go a place where you can just get a room, and some of the retreat centers will give you a room for a day. But if one of your goals is rest, I just think it’s nice to have a place where you can actually physically lay down because there’s something freeing about not having to have an alarm and just think, “I’m going to let God wake me up and see what that’s like.” When was the last time you did that? CW: So what do you think people who are going on a personal retreat should seek from the Lord? Rubietta: Really just God’s heart. I just see… I have children, and I just remember so many times my husband would come in tired from work and he would just lay down on the floor, and one of the kids would just come and just lay down on top of him and just put their head on his chest. That’s what I think of as the essence of a personal retreat. I give ideas in the book for each chapter, but it’s really just a place to hear God’s heart again, and to rest in Him. CW: In your book, you talk about examining your conscience as you go off on retreat. Why do you think that is important? The closing part of every chapter is the examination of conscience or consciousness; typically you see that at end of the day. You invite God to just show you: “where did I leave Your presence today, where did I miss You or let go of You, where did I, where did I hurt you.” I think we lose track of that. Part of our ability to rest comes from just staying connected throughout the day. So figuring out where you weren’t connected (either you broke it by sin or you broke it by forgetfulness), helps you think about how to move back into that place of grace because it’s not standing there in the way anymore. Even if we don’t notice sin, our hearts know. One of the benefits of doing a personal retreat - you move away from the chaos, you move away from your Daytimer and your Palm Pilot and your whatever-it-is. It gives you perspective. I’ve gone away not sure I loved anybody anymore. Getting away reminds me that wow, I really do love my God, I really do love my husband, I love my children. They may make me crazy but I really love them. Probably one of the great advantages to taking a personal retreat is it gives you perspective, all the fog clears and you can start to see again what the real priorities are. CW: You mentioned how it became necessary to go outside the church for help with personal problems. What do you think believers and church leaders can do to help people who have deep problems, but feel like they don’t have any place in the Church to get help? Rubietta: I think the more vulnerable people are, the more our people are given permission to be real, the more the Church will become a healing place. So often churches are places where you go and hear, “How are you? Look great, good. How’s your job? Good. How’s your kids. Good. How’s your husband? Good. How’s your whatever? Good.” Everybody’s fine, everybody looks fine, but nobody really is. What we believe is that everybody else is fine, but we’re really messed up. Thus we have to pretend to be fine, and that throws us into a kind of schizophrenic living where who we really are and who we pretend to be becomes farther and farther apart. And then something happens spiritually in that place and we either think that something’s wrong with us because Jesus didn’t heal us (I mean, obviously He healed everybody else’s problems in the whole church but ours), or we think maybe Christianity really isn’t real; that’s a real danger. If you find that, okay, there’s a big problem with anger, you just flew off, and then you go to the Lord, and God says, “I forgive you, I love you so much,” and then you go away saying, “Yeah, I messed up but God loves me so much, and I don’t mind if other people know how messed up I am, I know how loved I am, so I can go to church, and it’s okay if I just really screwed this up yesterday, I can’t believe I did this, but I’m not embarrassed to tell people that I’m a mess.” I think that gives people permission to realize that Jesus is real. People are still messed up but there really is grace, and I think that’s the only way we can grow. 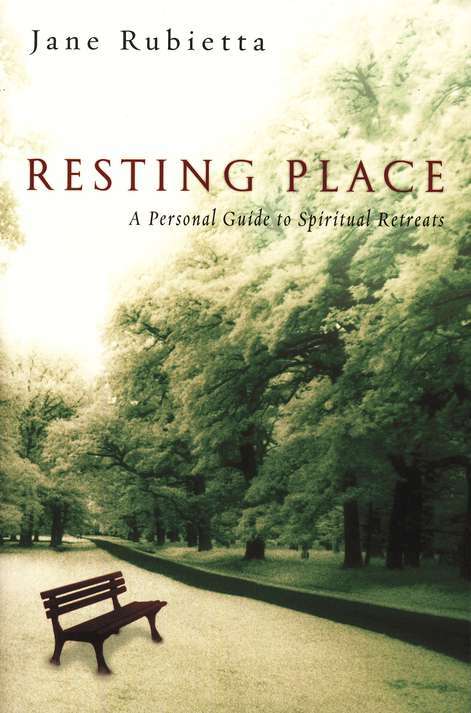 Resting Place released in 2006 from InterVarsity Press. Jane Rubietta's passion is to see people's hearts restored by the knowledge of the truth: that God absolutely delights in them, that God is crazy about them, that God would give everything on earth to make sure they know they are loved. The problem is, she says, “that we have lost our hearts. We are so busy stamping out fires and tending to a thousand urgencies every day, that we don't remember, don't notice, that our hearts have gotten trampled somewhere in all the stamping.” Jane speaks internationally and ecumenically, and audiences describe her speaking ministry as mesmerizing, deeply spiritual, funny, vulnerable, dramatic, and personal. In addition to Resting Place, Jane is the author of Grace Points: Growth and Guidance in Times of Change (InterVarsity Press, 2004), How to Keep the Pastor You Love (IVP, 2002), the award-winning Quiet Places, Still Waters (a Gold Medallion Nominee), Between Two Gardens (Bethany House, 2001), and, with Shirley Mitchell, Fabulous after 50 (New Leaf Press, 2000). Her articles have appeared in magazines such as Physician, Focus on the Family, LifeWise, Moody, Today's Christian Woman, Plus, Christianity Today, Christian Reader, the Lookout, and Decision.